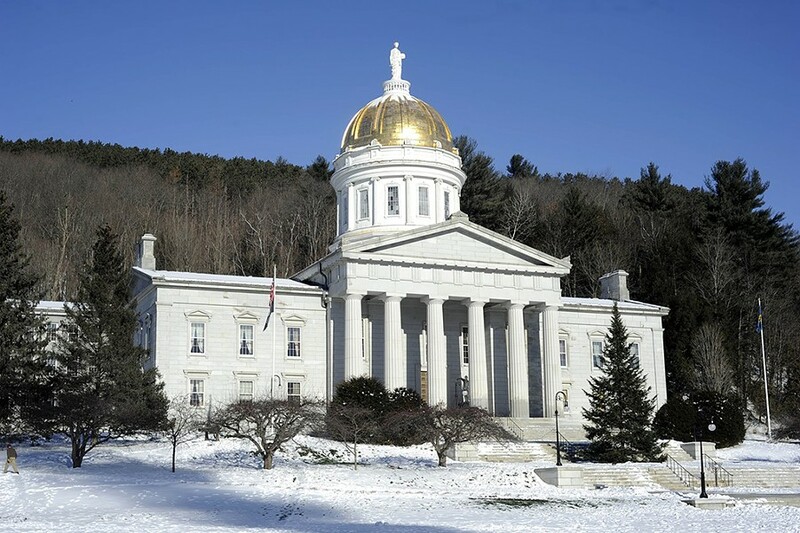 Now that Town Meeting recess is in the rearview, Vermont lawmakers are returning to work with the sense of urgency inspired by the imminence of crossover. That's the hard-and-fast yet conveniently malleable deadline for committees to send bills to either the House or Senate floor in order to be eligible for full legislative consideration. The big day is, well, Friday, March 17. And for all the stories about budget fights, quirky pieces of legislation, coffee taxes and a seemingly endless recount in the House, legislative committees have, in fact, been getting stuff done. There's quite a list of bills that are on track to beat the crossover deadline. But, hey, let's start with the bad news. It's all but certain that the Democrats' plan to raise the minimum wage to $15 an hour by the year 2022 won't make the cut. 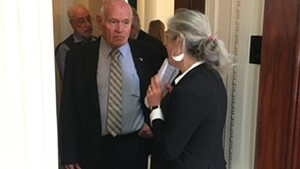 "As the House General, Housing and Military Affairs Committee heard testimony on raising the minimum wage, it became clear they didn't have all the data and analysis they needed to move forward right now," reports House Majority Leader Jill Krowinski (D-Burlington). State economist Tom Kavet is preparing "an in-depth analysis of the economic impacts," which probably won't be complete until next month. So the minimum wage bill won't meet crossover — but it should be ready to go for the 2018 session. How about that? A high-profile piece of progressive legislation may land on Gov. Phil Scott's desk during an election year. Coincidence, I'm sure. A waterways cleanup bill has already passed one committee and is now before the tax-writing Ways & Means committee, which is poised to remove the $31 million in proposed new taxes and fees it includes. It would still enact Treasurer Beth Pearce's proposal to issue $50 million in state bonds to fund the first two years of the cleanup and leave the question of a longer-term funding source for another day. H.196 would establish a paid family leave program funded equally by employers and employees. Workers would be entitled to up to 12 weeks of paid leave. Employers would be required to provide accommodation for pregnant workers under H.136. Another bill, H.462, would prohibit employers from seeking their workers' social media passwords. Krowinski says it's an effort "to address a growing issue in society." Last year, the legislature banned so-called "conversion therapy" for LGBT youth. This year there's a bill, H.230, which would guarantee access to mental health treatment for minors with sexual orientation or identity issues without getting approval from a parent or legal guardian. S.22 would increase penalties for possession, sale or trafficking of fentanyl, a synthetic opioid painkiller. S.61 would establish rights for offenders and inmates with mental illness, including the right to special legal counsel for defendants found incompetent to stand trial and requiring that mental health evaluations, treatment and services are available to inmates who need them. The "shield law," S.96, to protect journalists from being forced to reveal sources and turn over notes to authorities is likely to pass through committee by the Friday deadline. 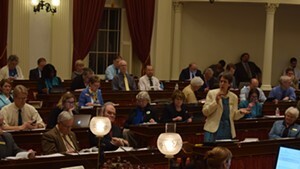 The Senate Health and Welfare Committee plans to pass a bill addressing the crisis in Vermont's mental health care system. Senators have freely acknowledged that the system is broken, but don't have a clear idea of how to fix it. The bill would mandate a series of studies to identify the fail points and bottlenecks in the system. The mental health bill also addresses severe staff recruitment and retention issues in the state's designated agencies — private nonprofits that provide services for the state on a contract basis. The bill would mandate a minimum of $15 per hour in pay for the agencies' staff. So far, the bill does not identify a funding source for the mandate; that will become a sticking point when it goes to the Senate Appropriations Committee. Finally, S.4 would require state-funded accountable care organizations such as OneCare to open their board meetings to the public. Two bills are likely, but not certain, to meet the deadline: S.99 would establish 14 new "tax increment financing" zones, two in each county, in which part of the cost of development projects could be financed by borrowing against future property tax growth triggered by the development. S.103 is a wide-ranging bill meant to impose new rules on the use of toxic chemicals in manufacturing. When you read coverage of the legislature, it's easy to get a misleading picture of its work. The media tend to focus on a handful of high-profile stories — the budget, marijuana, the election recount — and largely ignore the other work that's always going on. Budget issues aside, this session is on track to be productive, if not Earth-shaking. A confrontation is shaping up between Republican Scott and the Democratic legislature – but it's not over how deeply to cut the budget. Well, it sort of isn't. The real battleground is this: Scott is insistent on his plans to spend more on early childhood education, childcare, higher education and a few other priorities. It adds up to more than $18 million in spending hikes. He's also standing his ground on no tax or fee increases. Which means that the governor has set a very high bar for legislative budget-cutters. 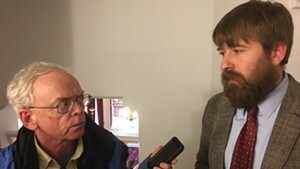 The House Appropriations Committee, in its effort to close a $72 million budget gap, has already stripped out the governor's plans for new spending. To hear Administration Secretary Susanne Young tell it, that dog won't hunt. "We will continue to encourage them to find savings to offset the expenditures the governor wants to make," Young says. "If we agree on the goals, we should be able to find a way to achieve those goals." There is broad agreement on the goals, but finding the money is another thing. For the administration, the primary target remains the education fund. Scott's original budget called for level funding of all school systems, with the savings shunted into the general fund. That plan went nowhere in the legislature. "We're convinced that there can be savings garnered in the education fund," says Young. "It's a $1.6 billion fund that educates 80,000 students. There have got to be savings to be achieved in there." She likens it to an outline of a hill. "You have the K-12 budget and it peaks up here, and on the edges we've got very little funding," she says. "He'd like to push down the middle and add on the ends." She adds a warning for lawmakers who might look for cuts in the general fund instead. "One of the governor's goals was to present a balanced budget that does not have deep program cuts," she says. "And if they're going to rely on general fund savings, I don't know what they're going to achieve without deeply cutting somewhere." And she makes it clear that "they" are on their own. "We'll see how the House Appropriations Committee does in achieving those goals," she says. "We'll react when we see it. I'm not going to get out in front of their process." To put it another way, the administration will let lawmakers take the hit for unpopular cuts, and sweep the legs out from under the Democrats if they go too far in trying to meet Scott's own budgetary targets. Meanwhile, time's a-wastin'. The House Appropriations Committee has to finish work on a spending plan — by March 24. A stunning bit of news hit our inbox on Friday afternoon. Sen. Bernie Sanders (I-Vt.) announced a series of events right here in Vermont. In front of actual living Vermonters! This shouldn't be a big deal, but, truth be told, Sanders has been almost as scarce as hen's teeth in these parts since he launched his presidential campaign in 2015. We don't have a full rundown of his travels because his office failed to answer our request for his schedule. But we believe that in the first two months of this year, Sanders attended a grand total of two events in Vermont that were open to the public. Yep. You can count 'em on two fingers. That all changes on Thursday and Friday, when Sanders will conduct a whirlwind tour of eastern and southern Vermont. There will be stops in St. Johnsbury, White River Junction, Brattleboro, Springfield, Bennington, Rutland and Randolph. Events include five town meetings, although three of the five are aimed at specific audiences — schools, senior centers and the like. The last time Sanders held a live, in-person town meeting in Vermont? According to information from his office, the answer is March 14, 2015 — two years ago this week. Sanders has been extremely active, of course, but his travels are aimed at an audience much broader than his home state. He's trying to build a national progressive movement from the ground up, a task that isn't advanced much by talking to us Vermonters. He's already got us in the bag. So why now? I sent an email to Phil Fiermonte, Sanders' top Vermont staffer. I sought confirmation that his most recent town hall was in March 2015, and asked if there's any particular reason he's appearing in Vermont now. For those who'd like to catch a glimpse of Sanders, or even ask him a question, your best options are at a town meeting in Springfield at the Riverside Middle School Gymnasium, 7 p.m. Thursday; and a town meeting at Vermont Technical College in Randolph, 3 p.m. Friday. The original print version of this article was headlined "Deadline Days"